Latest Govt jobs in MP state under Power Generating Company for the posts of Plant Assistant. 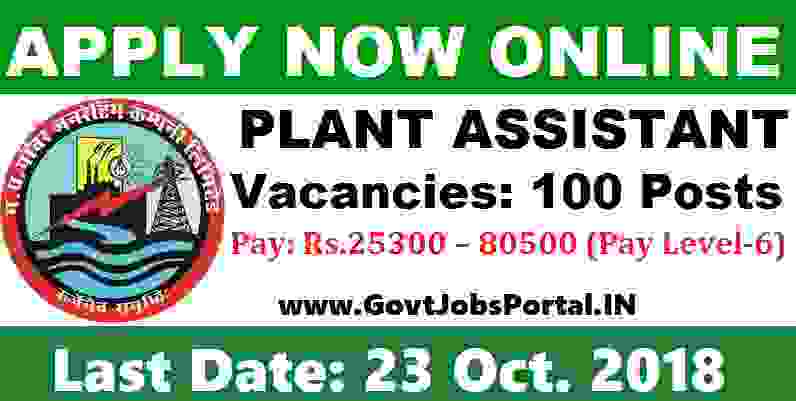 There are total 100 vacancies for the job profile of plant Assistant which are going to be filling up through this recruitment process. MP Power Generating Company invites Government jobs applications for the following posts as mentioned below after this introduction paragraph. All Qualified and interested applicants for this Power Generating company recruitment process may apply before the last date which was mentioned under IMPORTANT DATE section at the last. All the online Application form must be submitted in the prescribed format by filling up the detail of the candidates. Read the whole article carefully before applying for these MP Govt jobs. You should know the eligibility criteria and other information related to this Power generating company recruitment process before applying offline. We try to explain each and every prospective of this recruitment process in this article, so read it carefully before applying. Education Required: Those who have passed in their 10th class examination and also completes their ITI study in the respective trade can apply for these MP Govt jobs on regular basis. Age Bond: Applicant age must be in between 18 years to 40 years for applying these MP Govt jobs 2018. All General Category(UR/OBC) candidates have to pay Rs.1000 as their application fee while all reserved category candidates(SC/ST) have to pay Rs.600 as their application fee. You have to pay the application fee through the online method which may be by using Credit/Debit card or net banking. 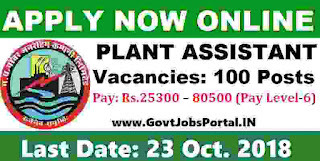 Process for applying Plant Assistant job profile is ONLINE through the official website of the department. The link for applying online will be activated on 24th Sept. 2018 and remain activated up to 23rd Oct. 2018. All eligible candidates have to apply online between these dates. For more information and for online application check IMPORTANT LINK Section at the last. 23RD Oct. 2018 is the Last Date to accept application form.